Widest Selection & Lowest Prices Guaranteed! Free Ground Shipping Continental USA. 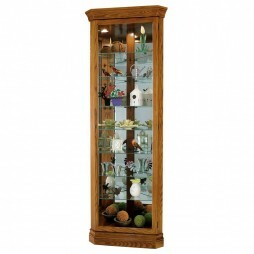 Present your collections in the Hammond Corner Display Cabinet. This timeless piece offers four glass shelves for plenty of display area, a glass mirrored back to reflect your treasures, interior incandescent lighting, and crystal-cut glass on the front-opening door. The cabinet is constructed from select hardwoods and veneers and finished in a Golden Oak stain. Adjustable corner levelers provide stability on carpeted or uneven floors. The Pad-Lock cushioned metal shelf clips increase stability and safety. The No-Reach light switch is conveniently located on the back of the cabinet. 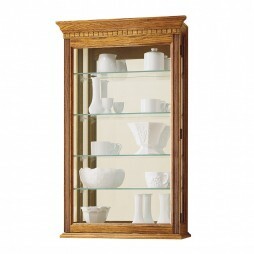 This classic corner cabinet features crystal-cut grooved glass on the front door. A glass mirrored back enhances your treasures. Four glass shelves offer ample space for your collection. Front-opening door provides easy access to the shelves. Incandescent lighting illuminates your collection. Finished in Golden Oak on select hardwoods and veneers. Adjustable levelers under each corner provide stability on uneven and carpeted floors. Cabinet is illuminated by an interior light. No-Reach light switch is conveniently located on the back of the cabinet. Pad-Lock cushioned metal shelf clips increase stability and safety. This item ships via freight. Please allow 1-3 weeks for delivery. THIS ITEM SHIPS VIA FREIGHT CARRIER. PLEASE ALLOW 1-3 WEEKS FOR DELIVERY. 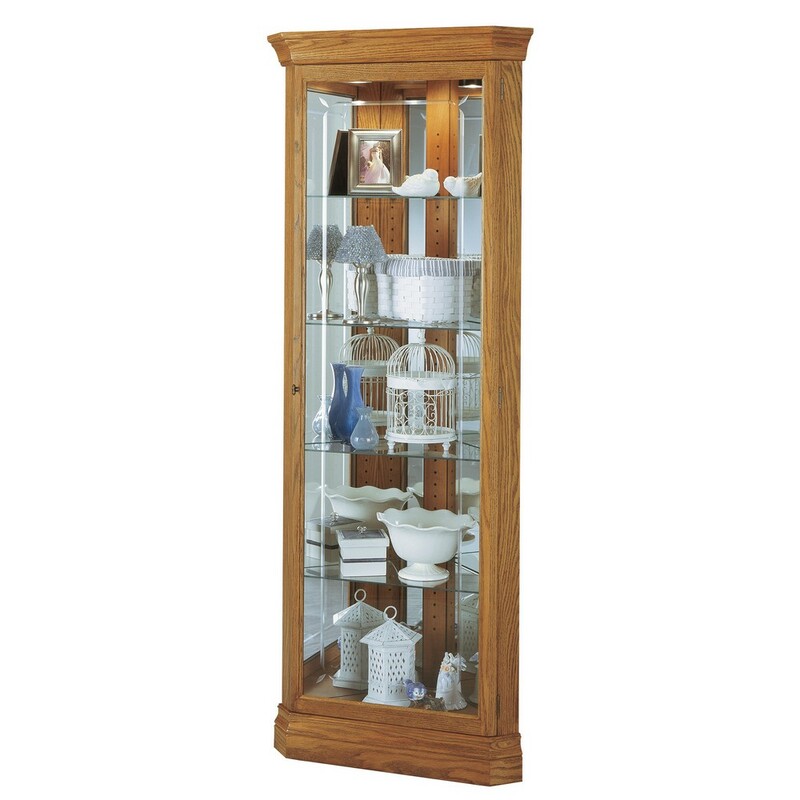 The traditional styling of the Wilshire Corner Display Cabinet begins with the curves and detailing on the pediment. It continues with the crystal-cut grooved glass on the locking door that follows these curves. The cabinet is constructed from select hardwoods and veneers and finished in a Golden Oak stain. The glass shelves can be adjusted to any level for easy display of your collection. It features halogen interior lighting for brighter, whiter, longer-lasting light with a No-Reach light switch located on the back of the cabinet. Pad-Lock cushioned metal shelf clips increase stability and safety. Adjustable corner levelers provide stability on carpeted or uneven floors. 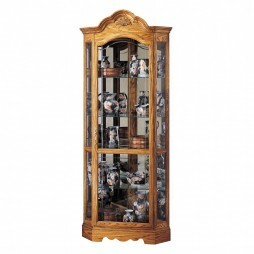 Showcase your collections in the beautiful Dominic Corner Curio Cabinet. This unique case offers a full eight levels of display in a picture-frame view of seven shelves and the display floor. It is constructed of select hardwoods and veneers in a Legacy Oak finish. The Pad-Lock cushioned metal shelf clips increase safety and stability. The glass shelves can be adjusted to any level to offer greater arrangement options. The adjustable levers under each corner provide stability on carpeted, hard or uneven floors. The glass-mirrored back enhances the display! Manufactured from select hardwoods and veneers, this beautiful cabinet has a detailed floral overlay on the top and complementing rosette accents on the lower corners of the door. The Constance Corner Display Cabinet is lightly distressed in a beautiful Hampton Cherry stain with highlights and glazing. It offers five levels of display with four fully adjustable glass shelves. Your collection is showcased by the mirrored back and interior lighting (controlled with a no-reach light switch on the back of the cabinet). Adjustable levelers under each corner provide stability on uneven or carpeted floors. The Pad-Lock cushioned metal shelf clips increase the safety and stability. 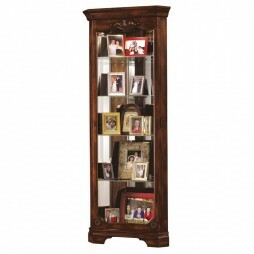 This cabinet is an elegant addition to any room! Constructed from select hardwoods and veneers in a rich golden oak finish, the Montreal Wall Curio Display Cabinet will add elegance to your home. This cabinet can be mounted on the wall or set on a table or mantel with its’ specially designed no-tip base. It features dentil molding on the pediment and reeded columns at the sides. The glass mirrored back enhances the beauty of your collectibles which are easily displayed on the four adjustable shelves. The hinged front door offers easy access. 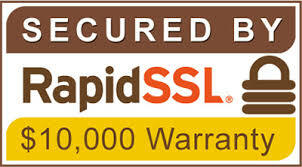 If you do not see a specific model, manufacturer or style, call us toll free at (866) 467-6460. Copyright © 2018 Decorative Clocks, Accessories for Home, Curios, Home Bars - Expressions of Time - All Rights Reserved.